"It was the best of times, it was the worst of times." For better or worse, your 20s are an essential time in your life. Careers, relationships, and an absurd amount of other stuff constantly occupy the minds of twenty-somethings at any given time. Fresh out of college, I myself have inadvertently learned quite a few life lessons as I delve deeper into this defining decade. Bad news, college friends: most real jobs require that you wake up before noon. The truth is, you have to catch on pretty fast when life is changing around you at the speed of light. We millenials are just trying to be happy — one success (or failure) at a time — and that's totally okay. We are all trying to figure it out. Read on to discover 22 crucial lessons I have learned about making it through my 20s in one piece. Love is hard. Some people get lucky and find long-term relationships right away, but don't feel discouraged — or like you have to be one of those twenty-somethings. It can take a few duds before you find a winner, so until the lucky guy comes along, enjoy being single. But when you do find him, don't take what you have for granted. Put down the donut... or the pizza or the chips or whatever it is that's calling your name from the kitchen cupboard. Okay, take a bite, then put it down. You're young, you're stressed, food is good — trust me, I get it. Unfortunately for us, the human body's metabolism rapidly slows down as it enters its 20s. That means you can't eat what you want anymore — one of the saddest truths in adulthood. Ah yes, let's take a moment to reflect on the early years when you could go out multiple nights in a row and feel like a million bucks by the end of the weekend. Say goodbye to those glorious days and hello to your new friends: Advil and coffee. We millenials love our smartphones. Sure, it's a great way to keep up with friends and news, but obsessing over what you tweet or post every moment makes you miss out on what's right in front of you. I'm worried that you'll be worried about worrying all the time after reading this post... see what I mean? We all fret way too much. Enjoy your life — these are supposed to be the best years, aren't they? You will get rent paid and you will kill that presentation at work; don't let those thoughts occupy the majority of your mind. Having a college degree is not enough anymore. In fact, it's the bare minimum. That means you might have to start off with a job or position that isn't necessarily ideal. It's a building block for making it to the top, so throw your twenty-something ego into the gutter and remember that you're not too good to start at the bottom. All of your peers are hanging out down here with you. 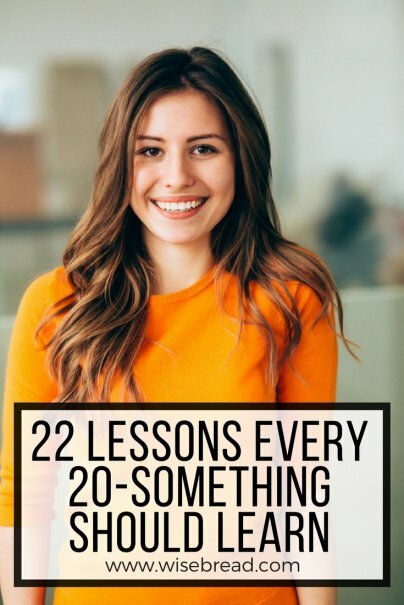 Have any lessons you have learned in your 20s? Let us know in the comments. Anyways the part of this article that stuck out to me the most was that we should make time for our family - I haven't talked to any of them in years out of guilt of not talking to them. When the thought of talking to them pops in your head, or really of just doing anything pops in your head, take the advise from our wiseman, Shia Labeouf. Just do it! Because the cycle I'm in is quite depressing.